I don't have DirecTV, so I haven't had the chance to watch season 4 of Friday Night Lights when the episodes originally aired, but I did stumble across the first part of the season online, and while I was watching it I couldn't help but be reminded of the one thing about the show that's always bothered me. Don't get me wrong, I think FNL is one of the best television shows today, and it's one of my favorites, but I've always been turned off by how minorities are portrayed on the show, and how that makes Texas look. Growing up in West Texas, I know from first-hand experience that it's not the most diverse places in the country, but the people do not fall into the stereotypes that can be found on FNL. Some people will think that I'm being too sensitive about the issue of race on a television show, but I think it's important to see what messages are being broadcast across the airwaves. From sesaon one on, most if not all of the minority characters are painted with a very small-minded, stereotypical brush. First off, we have Smash Williams who was the token black running back with a cocky attitude who only cared about football and his family, which of course was led by a single, working class mother. Apparently, giving a black youth a father was not cliched enough for FNL. Oh and let's not forget about the time he took steroids to get the edge because football was his only ticket out. The only two Hispanic characters on the show didn't get a fair shake either. In season 1, we were introduced to Bobby Reyes who was a Latino kid with a temper and he beat up a white student, and had no problem playing the race card. In season 2, Santiago, who is portrayed as a gangbanger, joined the team after being released from prison, and we never hear about him ever again. Great role models, right? At the start of season 4, the show had the chance to right the ship, but instead we get Vince Howard who is another fast, athletic African-American running back with a criminal record and a drug addict mother that cannot pay the bills. His friends are racists that are trying to convince him that "the Man" doesn't care about him, and they start stealing cars. Now, I grew up with black friends, and none of them came close to living that kind of life, but of course we'll never see a black character without some of these issues. Season 4 also introduces us to Jess Merriweather who is a beautiful, smart African-American woman, but she too is a single mother that has to save up all of her money to buy a bicycle because she cannot afford a car, and has to work at her father's BBQ joint. I'm hoping her character is given some more development because right now she's just playing the same role that a lot of other black characters played. To be fair, it can be argued that most of the white characters are not portrayed that positively either and could fall into the "white trash" or "redneck" stereotype, but for some reason they have better options. Matt Saracen has to take care of his sick grandmother, but he's a talented athlete who is also an artist, and it's his latter skills that gets him an offer to move to Chicago. Tyra Collette is your prototypical, promiscious underachiever who goes from being a D student to getting in to the University of Texas (one of the most prestigious state schools in the country). Matt and Tyra didn't need to be good at football to get out of Dillion, but Smash did. What does that tell you? Tim Riggins is essentially a bum, but he's so dreamy and dangerous that you can't help but fall in love with him. 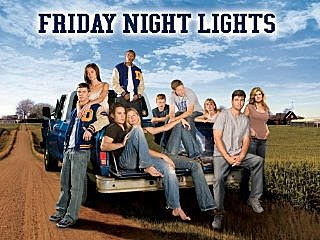 Let me be clear, I love Friday Night Lights, and I was super stoked when I heard that we're getting two more seasons, but I also wish it would take its portrayal of young, minority characters a little more seriously and didn't pigeon hole them. At least they can say they have a diverse cast, which cannot be said about some other shows like How I Met Your Mother (another personal favorite), so that's some progress I guess. @Anonymous - Thanks for the feedback. Thankfully FNL got a little better in regards to these issues as it went along, but not much.